Love from the Kitchen: Happy Jubilee QE2! 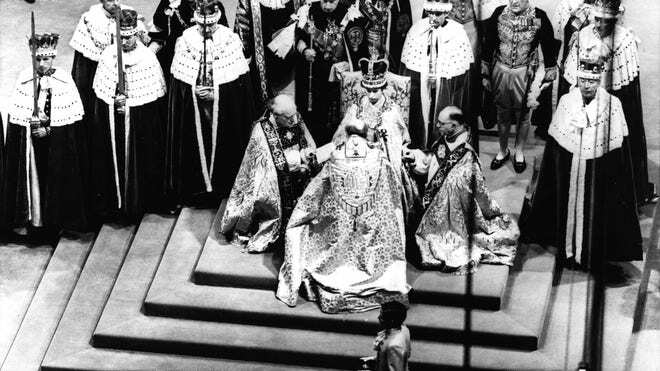 Queen Elizabeth has reigned for 60 years. 60 years! -- Queen Victoria was the last and the only previous British monarch to celebrate a diamond jubilee, in 1897. Queen Elizabeth II is the oldest British monarch to celebrate one, being 85 on the 60th anniversary of her accession, while Victoria was 77. -- Only three other world head of states have celebrated diamond jubilees during Queen Elizabeth's reign. Thailand's King Bhumibol Adulyadej marked his in 2006; the Sultan of Johor, which is now part of Malaysia, celebrated his in 1955; and Emperor Hirohito of Japan celebrated his in 1986. -- Queen Elizabeth II is the 40th monarch since William the Conqueror who obtained the crown of England in 1066. -- There have been 12 British prime ministers since the queen acceded to the throne. Winston Churchill was the first. She met current premier David Cameron when he was nine years old and acting in a production of The Wind in the Willows, playing a rabbit to the mole of her youngest son Prince Edward. -- There have been 11 U.S. presidents during her reign. She has met all of them except Lyndon Johnson. -- There have been six Popes during the queen's reign (Pius XII, John XXIII, Paul VI, John Paul I, John Paul II, Benedict XVI). -- The queen has launched 21 ships. -- The queen has sat for 129 portraits during her time on the throne. -- The queen has answered around 3.5 million items of correspondence during her reign, and she and her husband Prince Philip have sent around 45,000 Christmas cards. -- She has been on 261 official overseas visits to 116 different countries since becoming queen. She has visited Australia 16 times, Canada 22 times, Jamaica 6 times and New Zealand 10 times. -- Almost 1.5 million people have attended Queen Elizabeth's garden parties at Buckingham Palace in London or at Holyroodhouse in Edinburgh. -- The queen has owned more than 30 corgis, starting with Susan, who was a present for her 18th birthday in 1944. Many have been direct descendants from Susan. She currently has three corgis: Monty, Willow and Holly. -- The queen introduced a new breed of dog known as the "dorgi" when one of her corgis was mated with a dachshund. I'm a great fan of Queen Elizabeth. There are those who say that she leads a privileged life, and I suppose she does. One British friend of mine joked to me that she wherever she goes, she smells fresh paint! But I doubt anyone could argue that she has (and still does) devote her life to the service of her country. And at 85, she's got an insanely busy schedule!